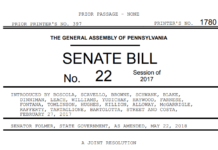 Pennsylvania uses two methods of doing redistricting — one method for the State Districts and another for the Federal Districts. The only Federal Districts affected by redistricting are the congressional seats. There is a formula in place that automatically takes the new population total for the United States and divides the 435 Congressional seats between the 50 states. Every state is a assigned so many congressional seats based on this formula. In 2000 Pennsylvania was assigned 19. In 2010, they dropped to 18. So after the 2012 election, there will be one fewer member of Congress from Pennsylvania. States retain basic control over how they specifically go about dividing up the seats within their states. Some states have specific State Constitutional rules. Other states do not (including Pennsylvania). A few states have some extra rules they must meet. But Pennsylvania does have a process. The decision rests with the our State Legislature (what we call the General Assembly — composed of Senators and Representatives). The new district boundaries are passed and enacted into law as a bill that is signed by the Governor. This bill begins in the House and Senate State Government Committees. The State Government Committee creates a district plan (the Redistricting Bill). The committee must approve this by a majority vote. Then it goes to the floor for a vote in the House. Next it travels over to the Senate State Government committee where they must approve it. Finally it makes it to the Senate floor. If passed by the Senate, then it goes to the Governor to be signed into law. At any point, the plan may be adjusted, but doing so means it sort of restarts the process. For instance, if the Senate would change the Bill, then the House would have to vote on this new, modified bill again before it went to the Governor. Once the Governor signs it, then there is about a month given for the public to file any objections (someone always does). The PA Supreme Court decides if the objection is valid and requires any map adjustments. If it does, then they are made. Not really sure if the court makes the changes or if the General Assembly is given a chance to fix things. By January, a final version must be in place so that the Congressional election of can proceed. Last time in Pennsylvania, the objections actually took a couple of years to address. In this case, temporary district boundaries are used (as determined by the Court) until the matter is resolved. As the name suggests, this is entirely a State matter. So the State rules take a number one priority and every state may have slightly different ways of going about this. In Pennsylvania, there is a 5 person commission. Four of the Commission members are predetermined. They are the Party Leaders in the House and Senate (the House Majority Leader, House Minority Leader, Senate Majority Leader, Senate Minority Leader). So that makes 2 Republicans and 2 Democrats. The fifth member of the commission is to be chosen by these four people to serve as a neutral party and, if necessary, cast the deciding vote. I don’t believe the four have ever actually agreed someone. This prompts plan B to go in effect. Plan B places the power to make the decision in the hands of the Supreme Court. Historically, they seem to always pick retired judges (which somehow circumvents the rule about not being on the government pay role). Unlike in Federal districts, the Pennsylvania Constitution has specific rules for creating districts that must be followed. This aspect is discussed in more detail under Ground Rules of Redistricting. Like the Federal districts, the approved district plan is subject to public objections. Once again, it is the Pennsylvania Supreme Court that determines which objections are valid and should be addressed. This is also under a similar deadline where all objections are to be addressed and resolved by January 2012. Initial maps should be released by the end of November 2011. In the spirit of transparency, the Commission has created a website that allows anyone to follow the process.